Arctic Cloudberry Seed Oil harvested from the Arctic Circle region of Finland provides more vitamin C than oranges and serves as a detoxifying agent for the skin. We blended Juniper, Cedar, Eucalyptus, Lemon and Lemon Verbena organic essential oils to create this authentic Scandinavian hand and body moisturizer. This is our line of premium Scandinavian derived organic bath and body products. They were formulated using mostly sourced Scandinavian ingredients. They were all given product names of Nordic origins. They contain pure therapeutic grade essential oils (most are organic). Our Nørdik Hand & Body Moisturizers are formulated using Jojoba Oil as our base oil. We have also sourced several “super fruits” from Scandinavia that result in a synergistic blend that creates a very premium moisturizer. Arctic Cloudberry Seed Oil (Finland) and Arctic Lingonberry Extract (Sweden) are highly antioxidant ingredients that are excellent for skin cell regeneration and a reduction in wrinkles. We use “sulfate/ paraben free preservatives” phenoxyethanol and caprylyl glycol in all of our Nørdik Hand & Body Moisturizers. We are very proud of this line offering as Mike&apos;s grandparents emigrated from Scandinavia; his grandfather from Finland and his grandmother from Sweden. 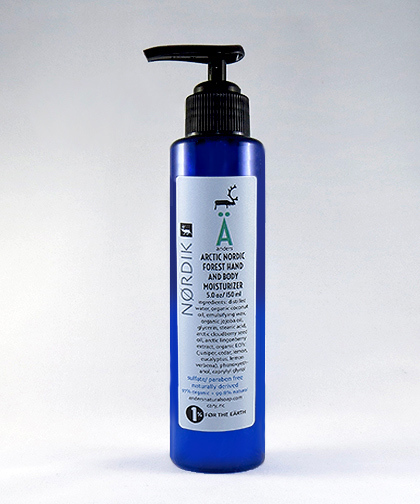 Our moisturizers are packaged in cobalt blue PET bottles and a back pump with a rectangular label attached. Steam distilled from the berries of the Juniper tree, this beautifully fragrant essential oil makes a great ingredient in skin care. Naturally astringent, Juniper essential oil is great for toning skin. It&apos;s particularly useful in body care products. Cedar essential oil is extracted through the process of steam distillation from wood pieces of the cedar tree. Cedar essential oil aids in the treatment of eczema. It is also an antifungal and antibacterial in the treatment of skin, and has also been proven to be an effective mosquito repellant. Cold pressed from the rind of the Lemon, this bright oil has an uplifting, delightful aroma. Powerful in aromatherapy, Lemon essential oil calls to mind a feeling of cleanliness and refreshment. Used in body care products, it has been shown to brighten and tone dull skin. Steam distilled from the freshly harvested leaves of the Lemon Verbena plant. This oil has been shown to possess antioxidant and anti-inflammatory properties. In body care products, it is cleansing, degreasing and toning to the skin. In aromatherapy, it is calming and also helpful in regulating mental focus.